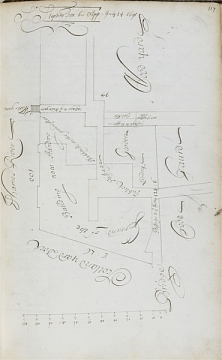 By Hawksmoor in pen and brown ink with names of areas within the site, including title at the top, S.r Stephen Fox his App: July 14. 1691, and Ground of the Building now Standing, within area marked 97 : 3 and 100 between Bridge at bottom right, and Water gate at upper left centre; and on verso with orders from July and August 1691 (see Wren Society, XVIII, p. 76). Pen and brown ink over pencil, on original writing paper of volume; 230 x 357. The plan relates to Wren's response of 14 July 1691 to an undated petition by Sir Stephen Fox, copied into the 'Court Orders' at fo. 115 v. (Wren Society, XVIII, p. 75) on the page following an order dated 11 June 1691 (fo. 114 v.). North is at the bottom of the sheet. Hawksmoor's drawing marks in dotted outline within the area inscribed Ground of the Building now Standing the lines of passages and areas that have been, or will be, removed as a consequence of Sir Stephen's Fox's appropriation of this land for the building of his lodgings. The entire site marked as 124 feet 6 inches long by 94 feet west to east. The length along the Thames frontage is 100 feet and the oblique side bordering Scotland Yard Dock is 97 feet 3 inches long.At All Souls College are three plan studies for Sir Stephen Fox's house on this site, drawn by Hawksmoor, c.1691-92 (Geraghty, The Architectural Drawings of Sir Christopher Wren, 2007, nos. 334-36). They provide for a deep range on the river frontage and two wings on the west side enclosing a small open entrance court.